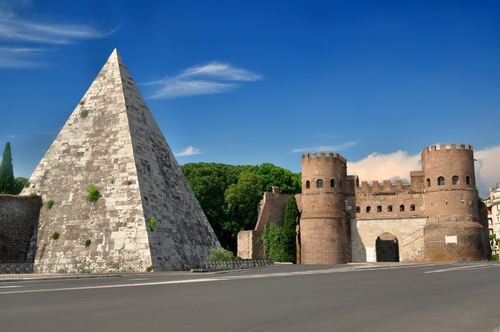 Off the beaten tracks of classical tourist paths stands one of the most ancient and intriguing monuments in Rome: the Pyramid of Cestius. Its shape immediately reminds us of more exotic cultures such as the Ancient Egypt… actually we are not wrong: this particular funerary monument was expressely commissioned by a Roman dignitary (Caius Cestius) few years after Rome had conquered Egypt (30 BC), an event which marked an increasing interests towards Egyptian customs and manners by the Roman citizens. Pyramid of Cestius is therefore the only surviving example of a trend which should have been widespread: proves show us the existence of some more monuments of this kind in Ancient Rome, which unfortunatley didn’t escape demolition. This pyramid’s survival is possibly linked to the fact that since III Cent AD it had been included in the Aurelian Walls and reused as a bastion rather than being abandoned to ruin. Renovation works have recently made it accessibile to public. Getting there is fast and easy: from Hostel Des Artistes just catch metro line B and get off at the namsake stop Piramide. Take advantage of being there to visit Eataly, the well-known market for original Made in Italy food products.